Charming villa for sale, tucked away in a semi-rural area at the foothills of Mojacar village, with stunning views of the Cabrera mountains. 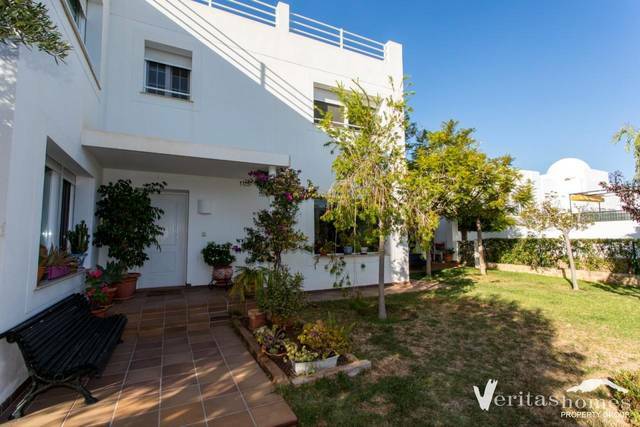 There are electric gates at the entrance to this property and the 2000 m2 plot is completely fenced. The villa has been fully modernised including new electrics maintaining the rustic style of the area. The property itself is primarily on the one level. You can enter the house either through the front door walking through the mature garden or through the back door going past the swimming pool. The back door leads straight into the kitchen and dining room with pantry and open fireplace. The kitchen is stylish with a speckled granite work top and windows over the sink looking to the patio and pool. The kitchen is newly fitted and fully equipped. There is a door leading from the dining room into what is at present the snooker room but could also be a large dining room or games room with doors onto the pool area and covered veranda. Another door leads into the hallway and the sitting room. This is large with an open fireplace, ceiling fans and AC with views to the garden and mountains beyond. The main house has 2 double bedrooms and 2 bathrooms. The master bedroom has built in wardrobes, AC, ceiling fan and an en suite bathroom. The second bedroom also has fitted wardrobes with AC and ceiling fan and a shower room. Stairs lead down from the snooker room to a very large library/study with independent access to the garden. This could also be a third bedroom or a treatment / yoga room. Next to the house is an annex with 2 spacious bedrooms and a bathroom with walk-in shower that gives onto the pool area. In addition there is a separate garage, automatic watering system, BBQ, outside bar next to the pool, oil fired central heating, air-conditioning and a heated swimming pool. Central heating and AC is in all parts of both houses as are ceiling fans. This is a very desirable property with endless potential. On the above Google map click on enlarge map and the exact location of the property in Mojacar is marked with the pin. The house is a 5 minute car ride from Mojacar beach.